Ridge gourd Chutney/Peerkangai chutney/Heerekai chutney is a great side dish for Idli, dosa and it is easy to prepare as well. 1) Heat oil in a kadai and add mustard seeds to crackle. Next add hing, urad dal and fry till light brown. 2) Add onions and fry till light brown. Next add tomatoes and green chillies and fry. Add ridge gourd and fry till they shrink in size and becomes tender. Leave it to cool down. 3) Transfer the fried ingredients to mixer, add jaggery and salt then grind them to fine paste. Easy and tasty Ridge gourd Chutney is ready. 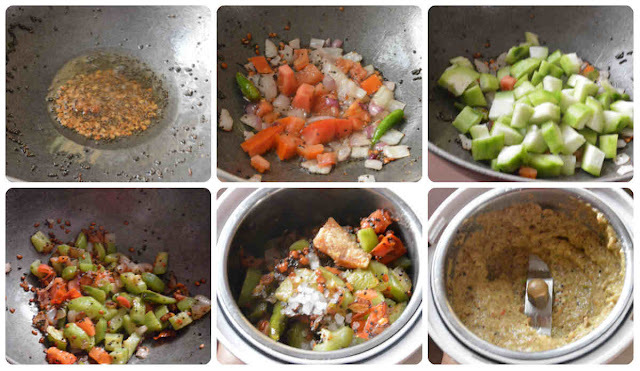 1) You can also add Red chillies in addition to green chillies. 2) For enhanced flavour, you can add few garlic pieces or ginger pieces or both while frying. 3) Some prefers to add ridge gourd with the outer skin.